Tag Archive | "dnd 4e"
The module itself is 32 pages long, printed in full color on what feels like good quality paper. 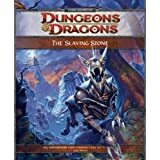 There are a total of thirteen encounters presented in the nice one to two page format that has become customary in 4th Edition Dungeons & Dragons supplements. Also included is an eight page foldout battle-mat of the town with a crumbling old mansion on the reverse side. There is very little in the way of artwork beyond the cover art and the encounter maps, unfortunately, and there are no handouts or props aside from the battle-mat. Although, I must say as someone who is incredibly horrible at drawing on a battle grid, I really appreciate having one included with the adventure. The Plane Above: Secrets of the Astral Sea follows close on the heels of The Plane Below, expanding on the upper fundamental plane of the 4th Edition Dungeons and Dragons “World Axis” cosmology. It presents a fantastic place where planar adventurers will find floating within an otherwise vast emptiness countless island motes, ancient battlefields, dangerous astral pirates, and the dominions of the gods themselves — some left shattered following a climactic battle fought eons past between the gods and the primordials known as the “Dawn War.” It is an ideal setting for a paragon or epic tier game and will make an excellent change of pace for the party who may have grown tired of the humdrum trappings of typical fantasy settings.